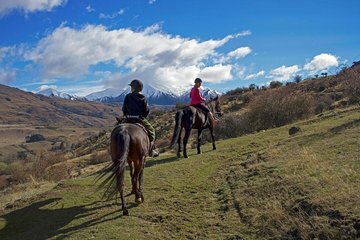 Saddle up for a horseback ride through the wild landscapes of the Cardrona Valley. Trace the path of the 19th-century gold rush, climb the mountains for a thrilling view over Wanaka Lake, and trot or gallop through the valley plains. Rides can be tailored for all levels, from complete beginners to experienced riders. Make your own way to Cardrona Distillery to begin your tour. After meeting your instructor, you’ll be introduced to the club’s equine residents and matched with a suitable horse – there are a variety of breeds, sizes, and temperaments to suit all levels, including first-time riders, so you’ll be sure to find the perfect partner. Then, mount up and learn the basics of stopping and steering your horse before heading out on the trails. Set out on a trail ride through the Cardrona Valley and enjoy an adventurous route, crossing streams, climbing mountain lanes, and passing traditional farms. Along the way, learn more about the region’s fascinating history, and hear tales of the 19th-century gold rush that swept the area. There will be plenty of time to pose for photos and admire the views before heading back. After safely returning to the stables and bidding your horse farewell, your tour finishes back at the Cardrona Distillery.